Born in 1265, Italian poet Dante Alighieri’s most famous opus, The Divine Comedy, is central to Dan Brown’s historical thriller, Inferno. Starring recurring hero Professor Robert Langdon, Brown’s story starts fittingly in Florence—the city of Dante’s birth. Inferno‘s dramatic version will be hitting the big screen soon causing me to reflect on how the book influenced me. The page-turner made me want to visit Florence more than ever. As I burned through the Inferno, I attempted to visualize the sites Dan Brown described. They were on the periphery of my mind’s eye, but couldn’t quite come to life. I had to see Florence for myself. As my trip to Florence grew near, I re-read Inferno; this time using it almost as a guidebook. I noted all the spots that I wanted to clarify further, especially the Boboli Gardens. Definitely the Boboli Gardens. What did this vast wonderland truly look like? In the book, Robert Langdon and Sienna Brooks used the gardens to elude their pursuers. With talk of sculpture-filled grottoes, dwarf statues, amphitheaters, and tree-covered alleys, it was too fantastical of a place for my imagination to bring to life. The Vasari Corridor was also at the top of my list. I couldn’t imagine what a corridor connecting two palaces by running atop a bridge and through the second stories of houses would even look like. It was with curiosity and excitement that I strolled Florentine streets taking in the sights and making my own pilgrimage to the main locations of the Inferno. There is no “right” way to see the Florentine sights described in Dan Brown’s book, but I’m going to highlight some of the more important places to the plot of the book, as well as sites that may not have been central to the story but are certainly interesting. For ease of discovery, I’ve grouped the sites by geographical region. Much action in the book (and I presume the movie) takes place in the Boboli Gardens, so they’re a fitting place to start your Inferno pilgrimage. Robert and Sienna don’t use a posted entrance; instead they choose to avoid capture at the Porta Romana by entering a back way. That way won’t be open to you, but history buffs will want to see the old city gate (1327) which gives an idea of how Florence once looked when it was a walled city. With their fountains, statues, flowers, grottoes, amphitheater, and buildings, the vast Boboli Gardens provide acres and acres of enchanting scenery. It is easy to see how Robert and Sienna could escape their pursuers. Visit them and you’ll understand what Robert means when he calls the stone basin from Rome’s Baths of Caracalla the “world’s largest bathtub.” The Boboli Gardens are the backyard of the Palazzo Pitti. Although the main characters don’t spend much time in the palace, it is definitely worth a visit. One-hundred and forty sumptuous rooms of fascinating art and decadent decor show how much wealth and prestige prominent Florentines enjoyed during the height of the city’s prominence as a city-state. The Vasari Corridor soars provides covered passage from the Palazzo Pitti to the Palazzo Vecchio. Built in 1565, the Giorgio Vasari-designed enclosed walkway gave Cosimo I de’ Medici a way to get from home to work without worrying about getting a knife in his back. The corridor soars above the city and atop the Ponte Vecchio (old bridge). 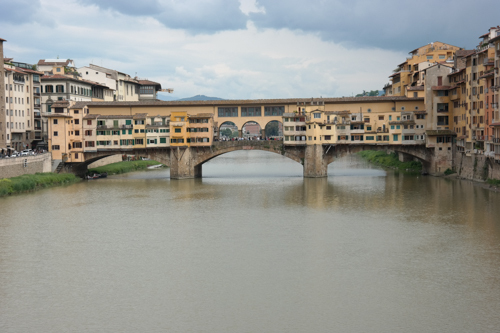 Rumor has it that a grand duke banned the butchers who had long sold meat on the bridge because the odor of spoiled meat rose up to the Vasari Corridor offending the nobleman’s nose. Rumor also has it that the reason Adolf Hitler spared the Ponte Vecchio when he ordered the destruction of Florence’s other bridges was his fondness for the artwork lining the passageway. At the end of the Vasari Corridor, is an important place in the book and a great place to visit—Palazzo Vecchio. Outside the building is the Piazza della Signoria where a monk named Savonrola once encouraged the burning of “vanities” including priceless works of art. He was later executed in that square. Today it boasts copies of great statuary (like Michelangelo’s “David”) and originals, too. More of Florence’s great artistic offerings can be found in the piazza’s adjacent Loggia dei Lanzi—the square’s open-air sculpture gallery. Inside the old palace, Robert and Sienna race around the joint raising quite a ruckus. You may wish to take a tour of the hidden places of the Palazzo Vecchio, like Robert did, or you may wish to explore on your own. Giorgio Vasari’s monumental painting, The Battle of Marciano, in the Hall of Five Hundred is where the words “cerca trova” are indeed hidden (this is a point of the book, but I don’t want to spoil it). 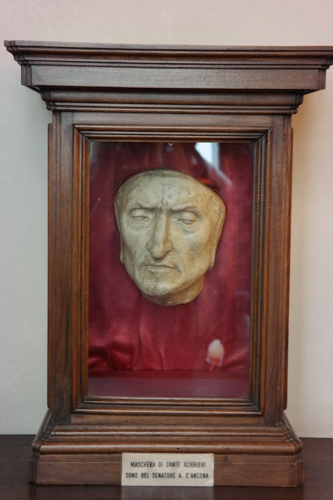 See Dante Alighieri’s death mask and explore the many facets of this place. Part government building and part former Medici residence, the main floors are exquisite. Underneath the Palazzo Vecchio is an archaeological excavation where you can see the city’s Roman underpinnings. On your way to another important area of town, Piazza del Duomo, stroll by Badia Fiorentina (the town from which the book’s antagonist leaps to his death), the Bargello (former prison now art museum), Casa di Dante (house on site of Dante’s birthplace), and Chiesa di Santa Margherita dei Cerchi (Dante’s church where he first saw his love, Beatrice). Giotto’s Bell Tower and Cattedrale di Santa Maria del Fiore (more affectionately known as the Duomo for its famous cupola) play second fiddle in the book to the third major monument on Piazza del Duomo, the Baptistery of San Giovanni. Climb either the tower or the dome—both if you’re feeling adventurous—to see amazing views of Florence and the countryside. Climbing the Duomo is torturous, but you get fantastic views of the interior of the dome and the rest of the church. The Baptistery is most famous for its doors. Ghiberti’s doors that Michelangelo dubbed the “Gates of Paradise” are fabulous. Look at the replicas on the Baptistery or go to the Museo del Duomo to see the originals. Inside the Baptistery are fabulous golden mosaics depicting heaven and hell…and a lot in between. I’ll leave you with one last place to explore. Although Robert and Sienna didn’t visit it in the book, Robert mentions the Galleria dell’Accademia, because of its famous statue—Michelangelo’s David. Langdon remembers seeing it for the first time when it sparked his “first true appreciation for the power of great sculpture.” David had the same effect on me. I hadn’t truly appreciated sculpture until I gazed upon that 14-foot marvel. 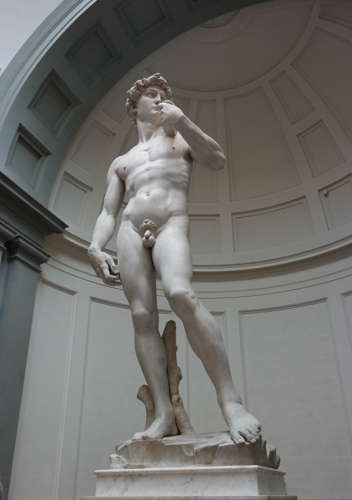 David’s muscles, his piercing eyes, his contemplative attitude, his confidence…it set off a love for Michelangelo’s works and for Florence in general. I was scarcely back on U.S. soil before I booked a return trip. Until next year, I’ll just write about places to visit from Inferno and let my fire grow. Next year, I’ll also travel to Venice, a hot spot in Dan Brown’s Inferno, and travel down the Grand Canal, visit the Doge’s Palace, stand in St. Mark’s Square (hopefully without being bombed by pigeons), and see the glorious golden interior of St. Mark’s Basilica. Since I plan to see the famous horse statues up close and personal, maybe I’ll be able to figure out one of the book’s enduring questions about them. But I don’t want to give too much away…. Psst…Roaming Historian readers can save money on Roman Guy tours! And they have tours that cover Florence! Just use the Roman Guy promo code “ROAMING” when booking to get 5% off of most small-group tours. Buon viaggio! Great blog post! I took Inferno Walking Tour when I was in Florence a few months ago. It started in Boboli Gardens and took you to all the places that Professor Langdon went. I loved it, and I love Florence!!! That tour sounds great! I’ll have to check into one. I definitely want to go on the Hidden Itineraries tour of the Palazzo Vecchio.